For everyone else who participated…. A Huge THANK YOU! Please check out my current giveaway at http://wp.me/s2WVaA-imagine, I would love for one of you to win those books as well! I love reviewing books and finding gems where I had not expected them. I was very blessed to have been asked to review the book “Lead Your Family Like Jesus” by Ken Blanchard, Phil Hodges and Tricia Goyer. I love Tricia and her books but wasn’t quite sure about this one because I have never read anything by the other two co-authors of this book. I have to say at the beginning that this book is amazing! What I love the most about it is that it is written with three points of view, with both sexes represented. I love this because dads and moms can see things differently sometimes and this approach covers the different perspectives and points of view very well! While reading the first thing that really struck me was this comment in the introduction, “God has gifted you with your children. Will you nurture them with a servants heart, as Mary and Joseph nurtured Jesus?” How often do we feel like the all powerful parent that needs to be in charge, instead of… the servant parent that wants to help our children grow and become exactly what God intends them to be, not what we intend them to be? I often only want my daughter to do what I want her to do, instead of taking the time to see her perspective and serving her the way I should. That doesn’t mean she gets away with things, but it means I need to look at how and why she is doing what she is doing and why I act the way I do. “Am I seeking to serve God and the well-being of my family members, or am I seeking my own self-interest?” Often, it is my own interests that I am protecting. Another thing I loved was when Ken talked about things that are Important Forever or Temporary Stuff. When going through your day trying to figure out what is most important ask this question, is this important forever or is it just temporary stuff? It really opens your eyes to all the things we focus on that are not really important. Do I want my daughter to remember all the house work I do, or the chores that got done if something happens to me, or do I want her to remember that no matter what was going on, she came before all the stuff and that I loved her deeply and unconditionally? There are so many incredible nuggets in this book. I will be sharing more with you soon. I highly recommend getting this book and taking the time to create a plan on how to make an eternal difference in your kids life. I received a complimentary copy of this book, courtesy of Litfuse Publicity Group, for the purpose of review on this blog. All opinions expressed are honest and my own, and I have not been compensated in any other manner. 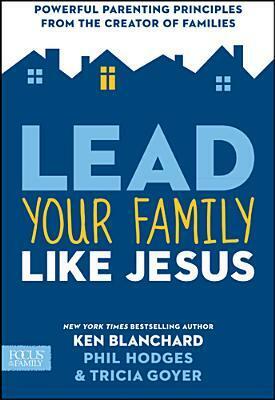 I am so excited to get to read the new book by Tricia Goyer, Ken Blanchard and Phil Hodges, Lead Your Family Like Jesus! To find out more about the book and the authors go to their website, Lead Your Family Like Jesus. There you can find out about the book as well as take a Free Parent Ego Assessment. Very eye opening! There is also a great resource page with videos and downloads. If you like what see you can pre-order the book and receive a free bundle of downloadable resources just for you! All you have to do is click the picture above to pre-order! Keep your eyes open in March for a review of this book right here! I am so excited! I absolutely love Tricia Goyer and her writings. She has some amazing books out there, fiction and non-fiction. Lead Your Family Like Jesus: Powerful Parenting Principles from the Creator of Families is Tricia’s new book that will be coming out in a couple months. I am so excited that I get to be part of her launch team and read this book soon. If you don’t know much about it you can click on the picture and it will link you to the book so you can take a look at it and even pre-buy it. Ken Blanchard wrote the amazing book Lead Like Jesus. Tricia, Ken and Phil Hodges all worked together using the same principles in Ken’s book and have come up with this amazing new tool for parenting. I for one and excited to get to read all that God has shown them. Look for my new review of this book coming soon. What is your favorite parenting book? What was the best thing you took from that book that you feel is a life saver for your family? Keeping our kid’s way pure is difficult at best. We are in a spiritual battle. “Many of us live each day as if we are in natural circumstances, when in reality – the trying circumstance that appears in the natural is a war being waged in the supernatural.” (Tammy Wollner) The fight for us and our children and our purity is supernatural. I loved reading this book and Tammy makes it clear that, “We as Christians need to wake up each morning, put on the armor of God mentally and spiritually, and be ready to do battle with Satan at any point in our day. Most of all, we need to train our children to practice this.” (Tammy Wollner) I could not agree more. We have a difficult enough time doing the right thing without a war raging around us. Add to our own weaknesses and disillusioned desires, plus the desires of the enemy, and we can never go without our armor. His Word needs to be buried deep within our hearts so we have the ammunition needed to fight the sworn enemy of our soul. Keeping His Way Pure addresses how this can be done with a great four step plan. 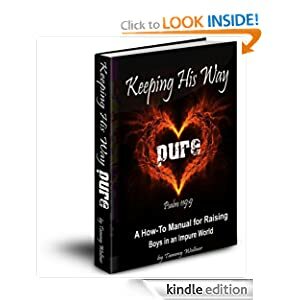 Psalm 119:9 says, “How can a young person stay on the path of purity? By living according to your word.” That is where Tammy’s four steps come in. The steps are easily laid out and give great pictures through experiences of what each step would look like. I also like that these things are not just her thoughts on what needs to be done, but that scripture is pulled in many times to show that it is God’s word not hers that shows us how to live a pure life. Along with the four steps Tammy offers sections for when the steps are not working and spiritual warfare. We all know that even if we do all the things that are right by God’s standards, things can still go wrong. Our kids have a mind of their own and a will of their own. And this book doesn’t forget about that and leave you hanging if the four steps don’t work. What I like most is that while this is written specifically for son’s, it can be used for our daughters and for our own lives. Everyone is called to live a pure life and all of the things taught in this book are excellent things to do for ourselves as well as our daughters and sons. This book was a great blessing and wonderful surprise. I highly recommend it to anyone wanting to make sure their children grow in the Lord and live a life of purity in all things. I was asked to do this review and though I was given this book I was not paid anything for my review. This review is truthful and honest and given freely. Thank you so much for the opportunity grow and learn while reading this book. It was a pure blessing, God Bless.